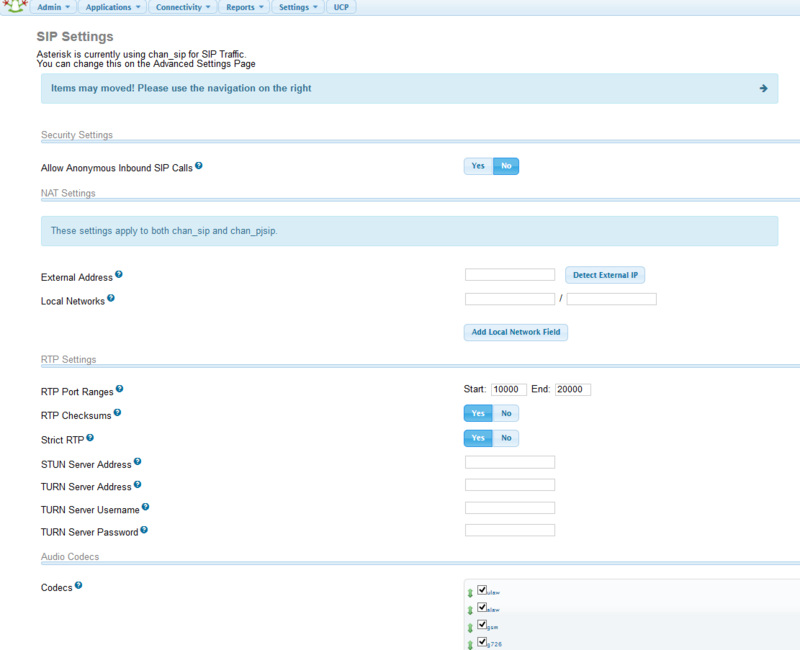 This article shows you how to configure Hoiio, a popular Singapore-based VoIP provider, to work with FreePBX. For demonstration purposes, screenshots from FreePBX version 12 will be used, although most of the steps will be similar for earlier versions. You would also need a soft-phone such as X-Lite in order to test the configuration. 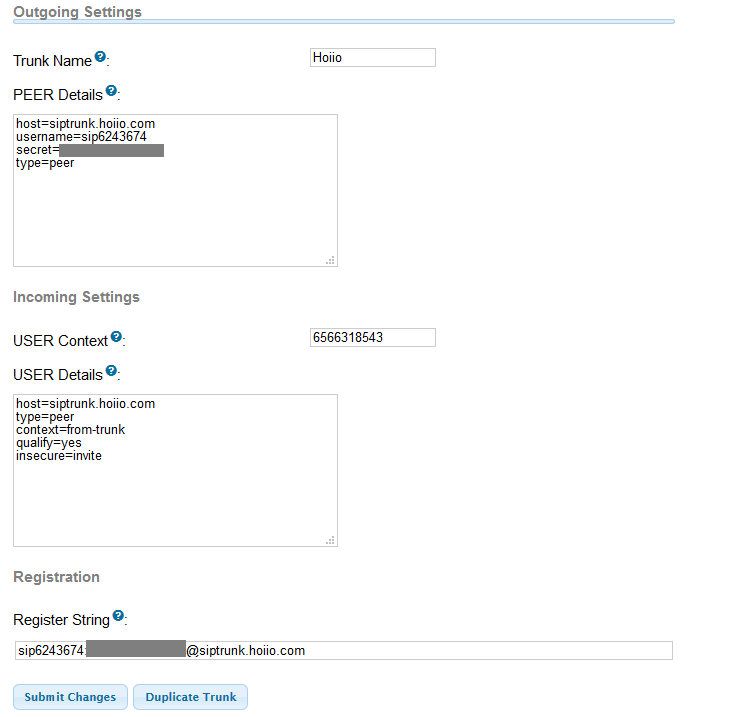 Click on Submit Changes to save the new SIP trunk. Type a name for the route, enter a dial pattern which wil be used as a criteria to determine whether calls should be terminated via this router, and select Hoiio as the first trunk in the “Trunk Sequence for Matched Routes” section. Refer to this more information on the dial patterns configuration. For now, simply type 65XXXXXXXX in the “matched pattern” text field – this will tell FreePBX will terminate all calls to Singapore numbers via Hoiio. Save the new route settings when done. You will need to configure an inbound route in order to receive calls made to your Hoiio account incoming number on your PBX. If your Hoiio account does not come with an incoming number or if you do not wish to receive incoming calls, you may skip this section. 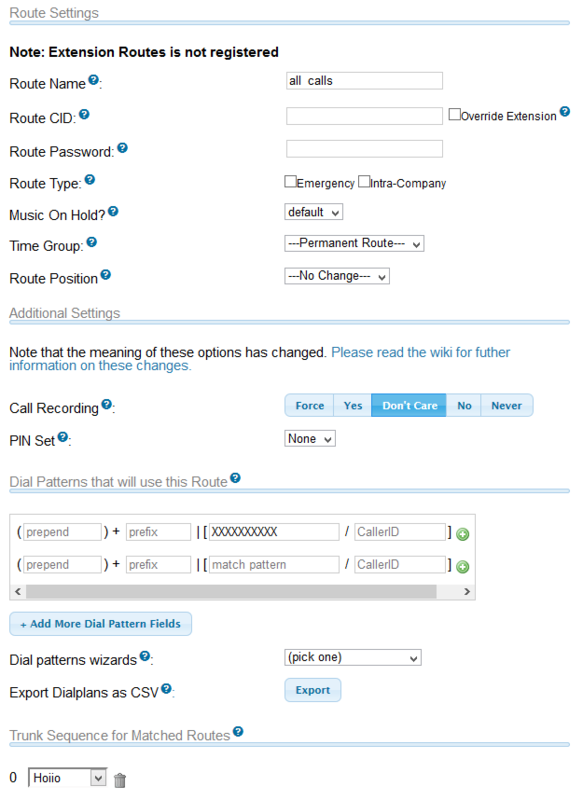 Select Outbound Routes from the Connectivity menu and choose to add a new route. Enter any name for the route and select a destination where incoming calls matching this route will be forwarded to in the Set Destination section. 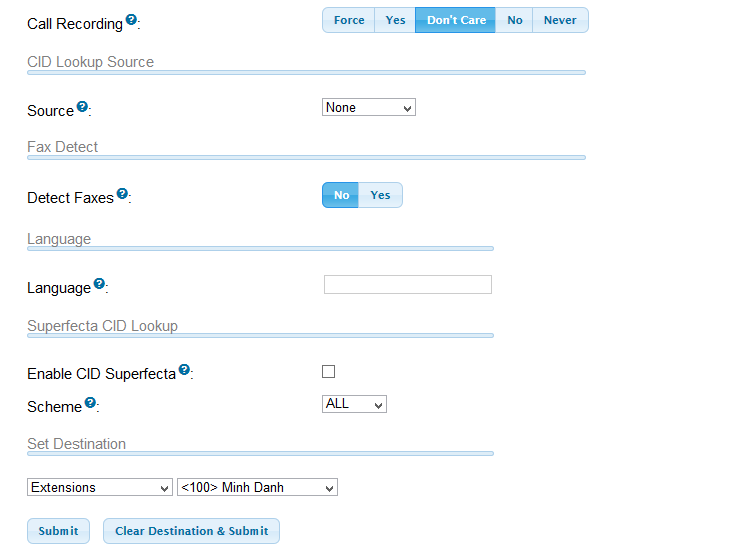 For simplicity, we simply select an existing extension to receive incoming calls. The rest of the settings can be kept as default. When you are done, click on Submit to save the route. Choose to add a Generic CHAN SIP Device and click Submit. In the next screen, enter any name for the extension, and a number for the extension (e.g. 100). In the Secret field, type a password for the extension. Remove the pre-defined value from the Deny and Permit fields to allow everyone to authenticate using this extension. After that, choose to save the extensions. First you need to test if your soft phone has successfully registered with the server. Its status should say “On Hook”, “Registered”, “Online” or similar. Now try to make a call to a landline or mobile number from your soft phone (e.g. 656xxxxxxx or 659xxxxxxx) and see if you can talk to the other party. If yes, try calling your SIP account external number from your fixed line or mobile phone. If everything is fine, you should be able to answer the incoming call on your soft phone. Congrats, you have successfully configured FreePBX to work with your Hoiio SIP account! If for some reasons your test call does not work, this section lists some common issues and how to fix them. Internal calls (e.g. calls to other extensions) are fine but calls to external numbers failed. Most likely, there is an error in your FreePBX configuration that causes calls not to be terminated on the configured Hoiio SIP account. Open Outbound Routes from the Connectivity menu and check that there is at least one rule that terminates calls on the Hoiio account. This is usually due to automatic adding of prefix to the number as a result of incorrect configuration. Some SIP clients may also have an option to automatically convert “+” to “00”. You should disable this, otherwise the wrong number may be called. Incoming calls to the external number are disconnected immediately or forwarded to voice-mail despite the destination extension being available. 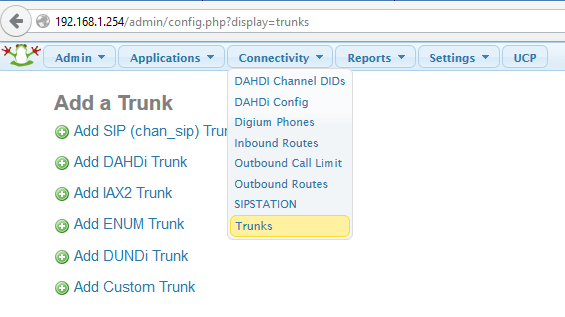 Connectivity>Trunks: make sure that the Incoming Settings for the Hoiio SIP trunk is correct. Connectivity>Inbound Routes: make sure that there are no conflicting inbound routes blocking incoming calls on the Hoiio SIP account. Additionally, some soft phones may have a do-not-disturb (DND) mode which will block incoming calls if enabled – check if this is the case. Asterisk also has a do-not-disturb mode for each extension that can be enabled by dialing *78 and disabled by dialing *79 from the extension phone. Refer to this post for more information. These settings are designed to ensure that the SIP client can maintain a stable connection with the server, but may cause issues if the network connection is bad or if the SIP client does not support the feature. Try to disabled these settings, re-register the extension and see if it helps. This is usually due to ports used for audio transmission being blocked by firewalls. 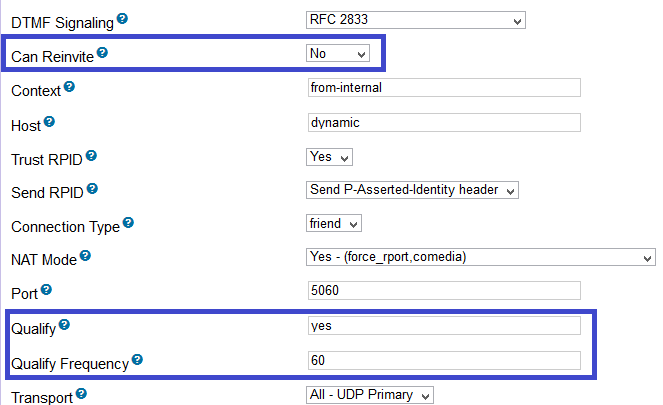 SIP requires UDP port 5060 to be opened for data communication and UDP port 3478 for STUN server usage. Additionally a range of UDP ports are used for audio transmission, which need to be opened on the firewall too. Dial *43 (Echo Test) on the soft phone client and try to speak into the microphone. If configured properly, you should be able to hear yourself speaking, which indicates that there should be no problem with audio transmission when making calls. The list of all extensions on the system and the default system extensions can be obtained from the Reports > Print Extensions menu. 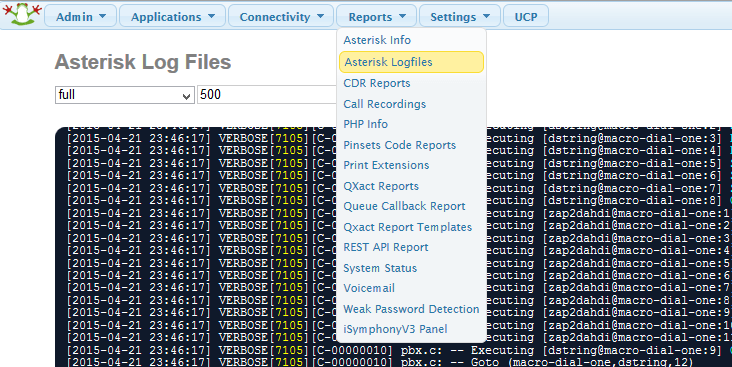 If you have direct access to the server, these log files are located at /var/log/asterisk. Refer to this article for more information. This is very helpful. Thanks tons MD!